Bastian Schroeder and Margot Peroni are a well-known duo at the Winter Equestrian Festival showgrounds in Wellington. An equestrian power couple, Schroeder is recognized as a leader in international equine transportation, and Peroni has a successful track record of showing horses in the hunters. With the launch of their new international shipping business, EquiJet, Schroeder and Peroni are looking forward to playing a greater role in the success of the local equestrian industry by ensuring safe, timely and efficient shipping solutions for the hundreds of people who bring horses from all corners of the globe to Wellington for the winter show season. For both, horses are a way of life. Growing up in Germany, Schroeder’s love of horses was passed onto him by his parents, who encouraged him to ride and saw him through a competitive riding career in Germany. Peroni’s upbringing was parallel to that of her husband. Competitively, winning the Platinum Performance $250,000 Hunter Prix Final at Hits-on-the-Hudson in 2015 aboard her mount Orlon is a highlight of Peroni’s riding career, along with her one-two division championship and reserve at the prestigious Washington International Horse Show in 2016 with Encore B and Orlon, respectively. Professionally, EquiJet has now taken center stage, quickly growing to be a well-known name in equine transportation in only a few short months of incorporation. Working together, the husband-and-wife team have already accrued a loyal clientele base, and have arranged the logistics, both ground and air, for numerous international competitors and sellers across the world. Though EquiJet is a fairly new enterprise, Schroeder has been an industry name in equine transport for more than 10 years. What initially began as a service for friends has grown into a full-fledged business endeavor with offices stationed both in the United States and Europe for the convenience of equine world travelers and their owners. As lifelong horse people, both Schroeder and Peroni are uniquely qualified to manage often complicated equine travel logistics, understanding in depth the multifaceted management and processes that must be organized correctly to get a horse door-to-door across nations and sometimes continents. Run by people with lifetime passions for riding, training and taking care of horses, EquiJet’s expertise and knowledge of the nuances of equine travel are unparalleled. The owners pride themselves on offering flawless coordination for horses traversing the globe, ensuring that not only are the animals transported safely and on time, but also accompanied by the appropriate documentation and equipment. With quarantine restrictions strictly implemented for all horses entering the country, the EquiJet team is equally equipped to handle those arrangements. With horses as a common denominator in their relationship, Schroeder and Peroni have successfully navigated the intricacies of the equestrian lifestyle together in both their personal and professional lives. At the show ring, Schroeder is there to support his wife, while also networking for business opportunities, and after taking the plunge as business owners, the two have further committed themselves to the equestrian industry at large. With so much of the North American equestrian market focused in Wellington, it was no question that the pair would be spending the winter season in South Florida during EquiJet’s first year of business. EquiJet’s owners will be situated in Wellington for the entirety of the Winter Equestrian Festival show season, along with their three horses, Orlon, Casario and Ivar. In addition to personally handling the import and export of horses into Wellington for their burgeoning business, Schroeder and Peroni will be frequent attendees of all of the events at the Palm Beach International Equestrian Center. 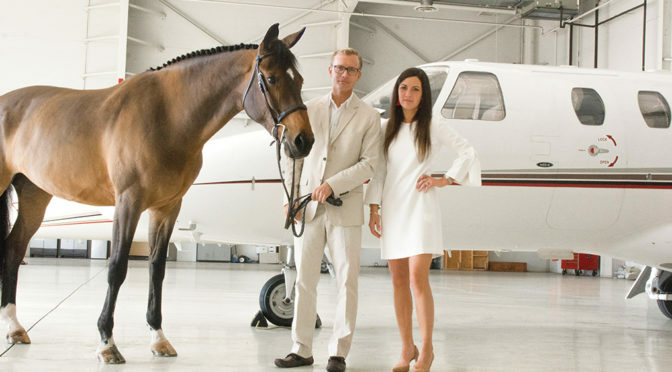 Whether competitively in the ring or professionally with EquiJet, one thing is certain: Bastian Schroeder and Margot Peroni are aiming to make waves in the equestrian community. For more information, visit http://equijet.com or call (833) EQUIJET.